Shah Rukh Khan's much-awaited film, Zero has hit the screens today. Shah Rukh Khan’s this year’s big release, Zero, directed by Aanand L Rai, has hit the screens today. Also featuring Anushka Sharma and Katrina Kaif in the lead, the film is one of the most awaited Bollywood films of the year. The promotions of Zero successfully created the buzz and now, the audience is all set to see SRK playing a little man on-screen. However, before all that happens, social media has got buzzed with various fake accounts in the name of journalists and film critics, who claim to have watched the film. A few of these Twitter users have even leaked stills and short clips from the film. 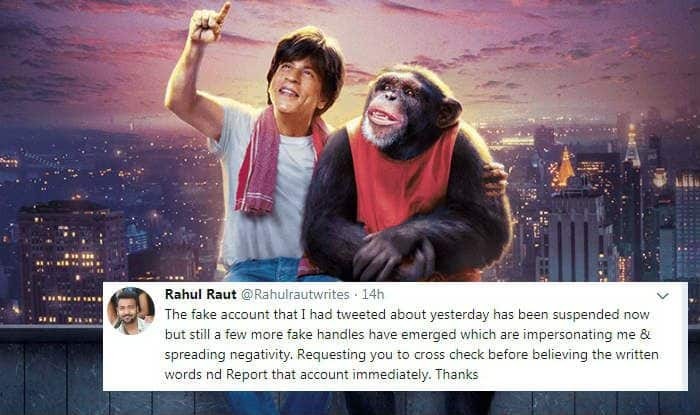 Accounts in the name of actor Manoj Bajpayee, trade analyst Komal Nahta, journalists Rajeev Masand, Anupama Chopra and writers like Rahul Raut and Himesh Mankad, are surfacing around assuring the fans to review Zero. Zero is SRK’s fourth film with Anushka, who plays the character of a scientist namely Aafia. The film has Katrina playing the character of a female superstar, Babita Singh. It is a love story with all the elements of a good popular Hindi cinema. Considering SRK’s last on-screen release, Jab Harry Met Sejal, couldn’t do wonders at the Box Office, Zero’s performance at the ticket window becomes crucial for the actor. In fact, in his recent interview, he talked about the same fear and mentioned that if Zero doesn’t work out for him, he will probably not be able to get any work for the next six months. Fingers crossed!